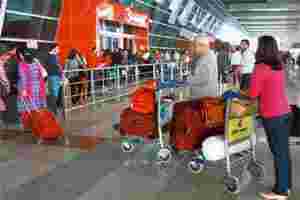 New Delhi: India’s airlines lose at least $25, or ₹ 1,300, on average every time a passenger boards an aircraft in the country and are set to post a record loss of $2.5 billion this fiscal year, estimates consulting firm Centre for Asia Pacific Aviation. The lowest economy airfare for December between Delhi and Mumbai is about $126. Airlines flew about 52 million passengers in 2010-11 in India and traffic this year has been growing in double digits. “This is the worst-performing year for the sector" in terms of losses, Capa’s South Asia CEO Kapil Kaul said. “These are record losses in the history of Indian aviation. Such losses have never been there even in FY08 when the fuel went up to $150 and operating environment was hard." The $2.5 billion loss would be on a total projected revenue of $10 billion, Capa estimates. State-run Air India Ltd, Jet Airways (India) Ltd, Kingfisher Airlines Ltd, SpiceJet Ltd, InterGlobe Aviation Pvt. Ltd-run IndiGo, and GoAir operate in the domestic market. “The paradox of India’s airline sector is that it serves one of the world’s fastest-growing economies and is posting double-digit traffic growth," Capa said in its research note. Private airlines excluding, IndiGo will make up for $600 million of the $2.5 billion loss; the rest will be borne by flag carrier Air India. India’s airlines have accumulated losses totalling $5-6 billion since 2008. Banks that have lent to these airlines may take a hit next year because of the huge losses, said Kaul. “One of the things we are seeing is banks are also going to factor an impact on their balance sheets next year," he said. Airlines stocks have taken a beating on BSE. Jet dropped to a two-year low of ₹ 176.95 on Tuesday, down 7.36%. The Sensex lost 1.33%. The last time the airline’s stock was at ₹ 170-180 was in April 2009. SpiceJet closed unchanged at ₹ 16.10 a share and Kingfisher was down 1.61% at ₹ 21.40. Mumbai-based Citi Investment Research and Analysis in a 12 December report cut its target price on Jet shares to ₹ 172 from ₹ 234.90, citing tough economic conditions, rising fuel price and debt among other reasons. “The key concern with the domestic industry is the high degree of fragmentation, which renders it a challenge to raise fares (and yields) in the best of times—in a challenging environment, the impact of high fuel prices/depreciating currency is exacerbated by the carriers’ inability to raise fares sufficiently to offset cost pressures," Citi said in the report. Kaul said the downward bias in Jet’s stock this week was “likely because of the money they may have to pay for EU carbon emissions tax." Indian carriers that fly to Europe may have to pay more than ₹ 300 crore in the first year alone from January under a proposed carbon emissions levy, Mint reported on 19 December. Kaul didn’t rule out a further slide. “It’s possible depending on what happens over the next two-three months, especially after Q3 results and on overall economic factors," he said. Airlines produced record losses in 2008-09 on the back of oil prices touching $150 a barrel. This year, the price has stabilized at about $100 and taking that as the benchmark, 2012 is likely to be tough. Yet, Kaul said no airline will shut shop. “The appetite for losing money is the highest in India" among airline owners, he said. “We expect a very, very tough 2012."